The parts of our fusion proteins were ordered as separate sequences: mRPF, Prancer Purple, sgBP, silk repeats, cellulose binding module, and keratin-binding domain. Constructs containing a chromoprotein sequence, a binding domain, and silk repeats in different combinations were assembled with Golden Gate. Purified and evaluated plasmids were transformed in E. coli production strain BL21, and the constructs were produced by inducing with IPTG. Proteins were purified with ÄKTA or a heat-based protocol based on our modeling results. The effect of protein production on cell growth. The binding of the cellulose binding module to nanocellulose and untreated cotton. The binding of the keratin binding domain to a keratin supplement and hair. The production of colorful silk fibers. The following sequences were ordered as gBlocks from IDT, except ADF3 which was ordered from GeneArt. All the sequences were designed with BsaI sites and overhangs that bind with the correct sequence that the part is linked to. Constructs can be assembled and ligated to the plasmid at the same time with Golden Gate assembly. BsaI sites are underlined. CBM and KBD were also ordered with a C-terminal linker at the beginning of the sequence so that they could be assembled with ADF3. We ordered each part of our fusion proteins as a separate sequence: mRPF, Prancer Purple, sgBP, silk repeats, cellulose binding module, and keratin-binding domain. Some of the proteins were designed so that they had a 23-amino-acid linker to facilitate the folding and function of the individual proteins within the fusion protein. Our DNA sequences were synthesised by IDT, except for the silk repeats which were produced by GeneArt. To assemble the sequences, we used Golden Gate assembly. The Golden Gate assembly enables the assembly of multiple sequences by using only one enzyme, BsaI. The sequences were designed so that they had the BsaI recognition site at both sides. In this way, after the digestion with the enzyme, each sequence is flanked by 4-base-pair overhangs that can be used for a subsequent ligation with the desired sequence. In each Golden Gate reaction, we joined one or more of our protein sequences with the pSVA1 plasmid. This vector was a convenient choice for Golden Gate assembly, as it is a modified version of pET28(+), having two BsaI restriction sites. Other features of the plasmid are a His6x-tag, enabling promoter protein purification, a T7lac promoter in the backbone, enabling promoter induction with IPTG, and kanamycin resistance. Figure 1. 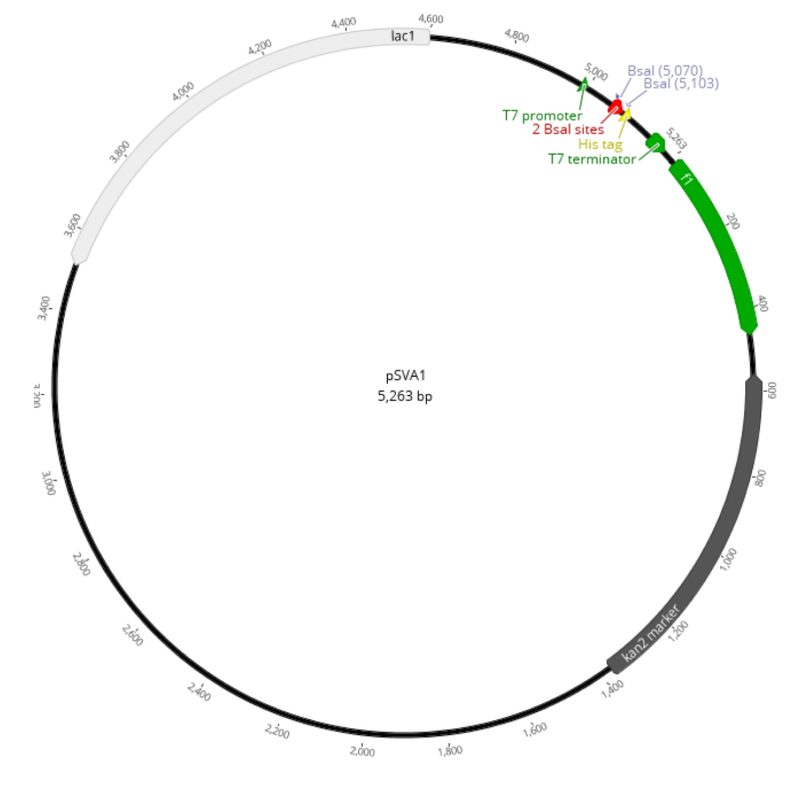 Plasmid map of pSVA1 (Geneious version 11.1.5). We also assembled constructs containing the chromoprotein sgBP, but for those, the cloning was unsuccessful. The plasmids, assembled with Golden Gate, were then transformed in DH10B Escherichia coli strain, which is optimal for cloning. The cells were made competent with the competent cells protocol. The transformant colonies were cultivated and the plasmids were purified from them with the Macherey-Nagel Nucleospin Plasmid kit. In order to check whether the vectors had the correct insert, they were digested with the enzymes NcoI and XhoI. The fragment sizes were then evaluated with a 1% agarose gel run. After ensuring that we had the right constructs, we purified the plasmids again using the Nucleospin Plasmid kit and transformed them in E. coli strain BL21. This was our production strain, as it enabled the expression of the fusion proteins, regulated by the T7lac promoter, by adding IPTG. We produced the constructs by inducing with a final concentration of 0,5 mM IPTG. Figure 2. The induced cultures, expressing our colorful fusion proteins. The proteins were then purified with two different methods.  The proteins not containing silk were purified with ÄKTA. However, this method is time-consuming and not suitable for purifying large amounts of proteins. Since the silk repeats have an unfolded structure, silk proteins can be purified with a protocol that involves heat to lyse the cells. Prancer Purple chromoprotein and the cellulose binding module we used are thermostable, so the silk purification protocol could be used to purify the constructs containing them. To find out whether the treatment would affect the stability of mRFP and keratin-binding domain, we modeled their behavior within the range of temperatures we would use. As the modeling results suggested that the proteins did not encounter any significant changes in structure within the temperature range, we purified all the silk-containing fusion proteins with the heat-based protocol. Figure 3. 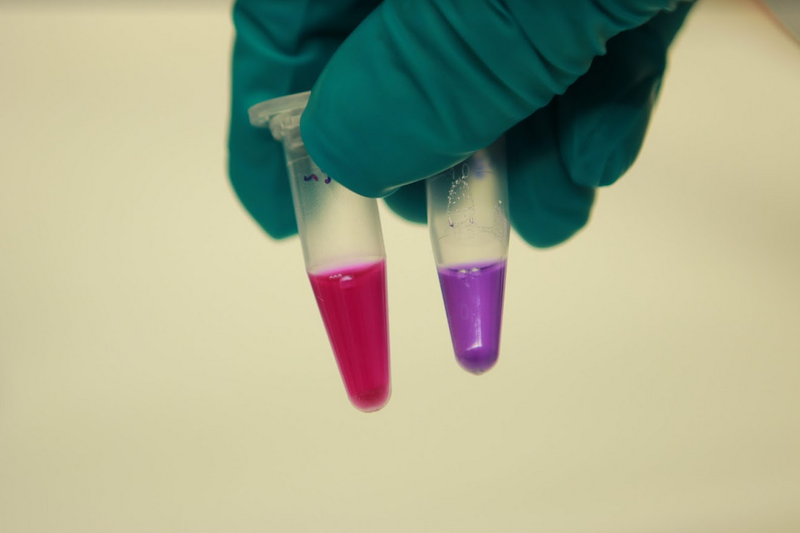 Our red and purple purified proteins. 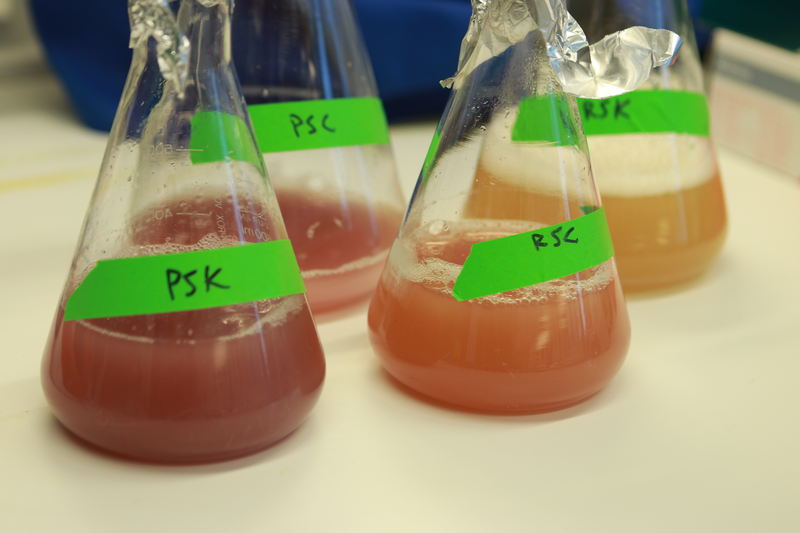 Since our fusion proteins are quite big, we wanted to test how the protein production affects the cell growth. E. coli strain BL21 with mRFP, mRFP-CBM, mRFP-KBD, or mRFP-silk producing plasmid were induced with 0.1, 0.5, or 1mM IPTG. We also had controls of each which were not induced. The cellulose binding module was tested with SDS-page. As cellulose, we used nanofibrils (CNF) derived from birch. 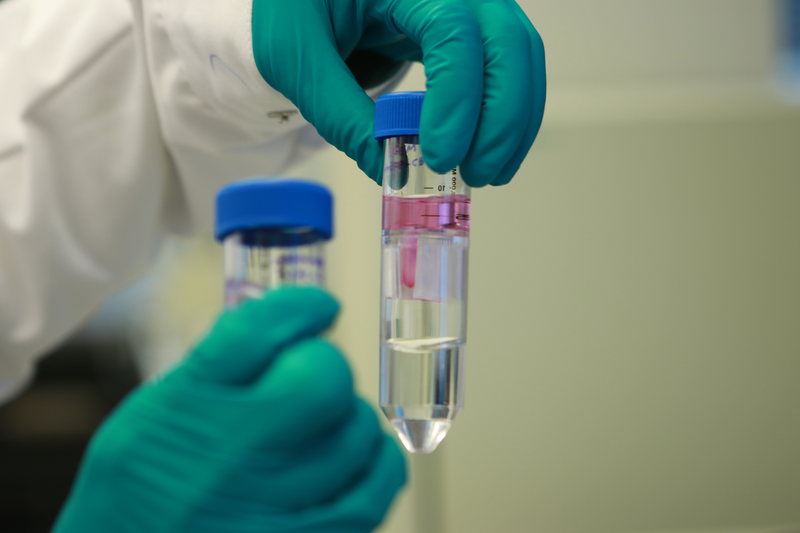 1%(w/v) nanocellulose solutions were prepared from stock concentration, and a binding test was conducted with different concentrations of proteins to CNF (1:1, 1:10 and 1:100). We also used our proteins containing the cellulose binding module to dye pure, untreated cotton. The test was performed by leaving a piece of cotton shaking in a dye bath covered with protein solution overnight. Color fastness was tested by washing the cotton with lukewarm water in shaking for 1 hour. We did not have the time or the resources to purchase pure keratin products for the test, so we tested KBD binding to keratin with Evonia Keratin+Biotin supplement. The supplement contains about 95% of keratin powder which we dissolved to water, and did a similar binding test as with cellulose. One of our interests was to try if KBD would bind to hair keratin. We had a 1g sample of light blond hair which we covered with concentrated PSK and incubated in room temperature for 2 hours. We followed a protein concentration protocol in order to obtain colorful silk fibers. The protein was concentrated with Econo-Pac® 10DG Desalting Prepacked Gravity Flow Columns. In principle, when the silk protein is concentrated, silk repeats interact with each other, forming a fiber. We tried to make fibers by inserting tweezers in our concentrated solution and carefully opening them. We added a drying step by using hot air to further concentrate the solution. Proteins were concentrated using the Sartorius Vivaspin 20 ultrafiltration centrifugal columns 30k MWCO protocol. Figure 4. To concentrate our fusion proteins, we used Econo-Pac columns. Inoculate entire 50 mL culture into 450 mL of LB + 50 μg/mL kanamycin into a 1-2 L flask covered with air-permeable membrane (using a large enough flask is important so the culture gets enough oxygen). The cells should have at least 18 hours to grow to maximize protein yield. During sonification, keep the falcon tube where your cells are in a beaker filled with ice to prevent overheating. Keep tip ~0.5 cm below surface, put lower if foaming occurs. 12.5μL of SYBR Safe DNA Gel Stain (ThermoFisher Scientific, no. S33102). Weigh agarose in an Erlenmeyer flask. Add 1X TAE buffer and heat up the mixture in the microwave oven so that the agarose has completely dissolved. Cool down the solution and add 2 drops of SYBR Safe DNA Gel Stain (ThermoFisher Scientific, no. S33102). Pour the liquid into a casting tray, place a comb (or two combs) in the tray and let the gel solidify. Once solidified, place the gel in a gel electrophoresis box, remove the combs and cover the gel with 1X TAE buffer. Load a DNA ladder (used: ThermoFisher Scientific GeneRuler DNA Ladder Mix, ready-to-use, no. SM0333) and the samples (see: sample preparation) into the wells. Connect the electrodes to a power supply (negative electrode is the end where the samples are loaded and positive electrode is the other end of the gel towards which the samples run). Run the gel electrophoresis at 110V. Add 1μL of 6X DNA Loading Dye (used: ThermoFisher Scientific DNA Gel Loading Dye (6X), no. R0611) in 5μL of DNA sample. Build the equipment: place two glass plates against each other in a gel caster. NOTE: Add APS and TEMED at the end, then mix the solution and pipet it between the glass plates. Add isopropanol on top of the gel to remove bubbles and make the surface even. After the separating gel has polymerized, remove isopropanol. Pipet the stacking gel mixture on top of it and place a comb between the glass plates. Let the stacking gel polymerize. Place the polymerized gel(s) in a running tank and fill up the space between the gels with the 1x SDS-PAGE running buffer containing diluted from 10X SDS-PAGE stock solution of 25 mM Tris, 192 mM glycine, 0.1% SDS. Add a sufficient amount of buffer in the tank surrounding the gels. Remove the comb(s) and pipet a ladder (used: ThermoFisher Scientific PageRuler Prestained Protein Ladder, 10 to 180 kDa, Catalog number: 26616) and the samples (NOTE: sample processing) into the wells. Run the electrophoresis at 110 V for ~1-1.5 hours until the samples have run almost to the bottom of the gel. Rinse the gels with H2O and stain them with Coomassie blue for 30-45 minutes with shaking. Keep the gels in the destaining solution (30%methanol, 10%acetic acid, and water) for ~1 hour (or more) until the bands become visible and most of the blue background staining is lost. The destaining solution may be changed during this time. After adding SDS Loading Dye into the samples, heat them at +95°C for 10 minutes. All steps from harvesting the cells should be carried out at 4°C and the cells should then be kept on ice whenever possible! Make sure the CaCl2, CaCl2+25% glycerol and Eppendorf tubes are pre-chilled as well. (Optional) Inoculate strain of E. coli into 3-5 mL LB and grow O/N at 37°C + shaking. Next morning, use 1 v/v % (40 μl) AND 2 v/v % (80 μl) of the O/N culture to make a 4 ml liquid culture of cells (LB, in a sterile plastic tube). Grow the cells at 37°C + shaking (~220 rpm) until the OD600 is between 0.3 – 0.4 (usually takes around 1,5 - 2 hours). Do NOT let the OD600 get > 0,5!! Keep the tubes on ice for 5-10 min. Divide the culture in pre-chilled Eppendorf tubes. Centrifuge the cells for 3 min at ~3300 g with a tabletop centrifuge. Check that there is a visible cell pellet on the bottom of the tube. Gently discard the supernatant. Place the tubes back on ice and gently resuspend the cells with 1 ml of cold 0,1M CaCl2 by pipetting. Centrifuge the cells again for 3 min at ~3300 g with a tabletop centrifuge. Check that there is a visible cell pellet on the bottom of the tube. Gently discard supernatant and resuspend each cell pellet in 100 μl of 0.1M CaCl2 (Or 0.1M CaCl2 + 25% glycerol if the cells are frozen). Keep the cells on ice for 20 mins, after which they are ready for transformation. If needed, store possible extra tubes in -80°C freezer according to teachers' instructions. Protocol based on CHEM-E3160, Biolab III -Laboratory Course manual, written by Heli Viskari, Mari Piirainen and Bart Rooijakkers. Add each part accordingly to sterile PCR tubes. Mix it properly by pipetting the solution up and down. Plasmid isolation was done using the Macherey-Nagel Nucleospin Plasmid kit. The protocol used was the “5.1 Isolation of high-copy plasmid DNA from E. coli”, which can be found from page 15-16 of the kit manual. Based on digestion protocol by Thermofischer. *Volume of the DNA can be scaled up to 10 μL or down to 0.5μL depending on the DNA concentration. Choose the amount of vector to be used (e.g. 50ng) and the molar ratio of the insert and the vector (we used 3:1 or 5:1). Calculate the amount of insert that is needed with the following formula: Insert (ng) = vector (ng) * insert (bp)vector (bp) x 5 (here: 5:1 molar ratio). Prepare the ligation mixture with the restricted vector & insert, and a negative control mixture with the restricted vector only. Incubate the mixture at 16 °C overnight or 2 hours at room temperature. Change lanes A1 and B1 into filtered (degassed) Milli-Q. Wash the pumps and system with MQ. Then wash the injection loop with 10 x column volume of MQ. Then wash the column to be used with 10 x column volume of MQ. Change lanes A1 and B1 into filtered Wash Buffer (30mM NaPi, 500mM NaCl, 20mM imidazole, pH 8.0) and Buffer B (50 mM NaPi, 500 mM NaCl, 500 mM imidazole, pH 7,4). Repeat the same washes as in step 2. Then change lane A1 into Buffer A. Make a suitable program for the purification in the software. Inject 4 ml sample into the sample loop with a syringe. Start the run. Fractions will be collected in tubes/plates. After the run wash the machine with filtered MQ, as at the beginning. Wash the machine with 20% ethanol. Store the machine in ethanol. Select elution fractions with the desired protein from the graph, and run flow-through and elution fractions on an SDS-PAGE. Pool fractions that contain the desired protein, freeze in liquid nitrogen and store at -20°C or -80°C. If the Sartorius Vivaspin 20 ultracentrifugation tubes have been stored in ethanol, start by centrifuging for ~45 minutes at 3000 g, until the ethanol has gone through the filter. Concentrate samples by centrifuging ~30 minutes at a time at 3000 g. Mix samples by pipetting and continue until you reach the wanted volume. Store samples at -80 °C after freezing in liquid nitrogen. Clean tubes by washing 2 times with 20 ml Milliq -water at 3000 g for 30-45 min. Store tubes in 20 % ethanol. On a flat bottom 96-well plate, Add 10 ul of cells to 200 ml of medium (~ 5 x 10^6 cells to start with). Make three replicates with 0, 0.1, 0.5 and 1 mM IPTG. Controls that can be used are water, growth medium without cells, and growth medium with cells that don’t produce fluorescent protein. Set the Temperature to 37°C. Shake Orbital for 6 min. Measure Fluorescence (From the bottom of the plate).